To start our year off, we teamed up with 'Student Council' for a retreat about student leadership. At the retreat, students began by building connections between each other through an interactive task. This helped everyone to recognize that there are many things that connect them to each other and that relationships are the foundation to working together. We then watched a 'Ted Talk' by Drew Dudley called 'Everyday Leadership.' The message was a challenge for us to change our perspective on leadership. Students were asked to view leadership not only as inspiring large groups of people, but rather as a simple as everyday actions that encourage, support and model what it means to be a good citizen of the world – because you never know whose lives you may change because of your small actions. We then broke into smaller groups to complete the 'Four Corners' activity developed by Cathy Berger Kaye. Here, students began by interviewing each other about their skills, talents, and interests. Then students looked in newspapers and wrote down global problems that the newspaper revealed while also adding problems other problems that exist in the world and at AISJ. At the end of the retreat, students wrote their name next to an issue that they feel motivated to change. We plan to use this activity to help us decide on what initiatives we want to focus on as a group this year. Our next few meetings with focus on targeting these initiatives. Bandana Day is coming up on October 12. Have you ever wondered why we encourage our students to buy bandanas each year? The Bandanas support The Sunflower Fund. The Sunflower Fund's core purpose is to educate, recruit and raise funds to build and sustain an effective South African Bone Marrow Registry as a viable source of well-informed ethnically-diverse potential bone marrow donors so as to meet the national and international requirements and improve the chances of life-saving transplants for serious blood disorder sufferers. 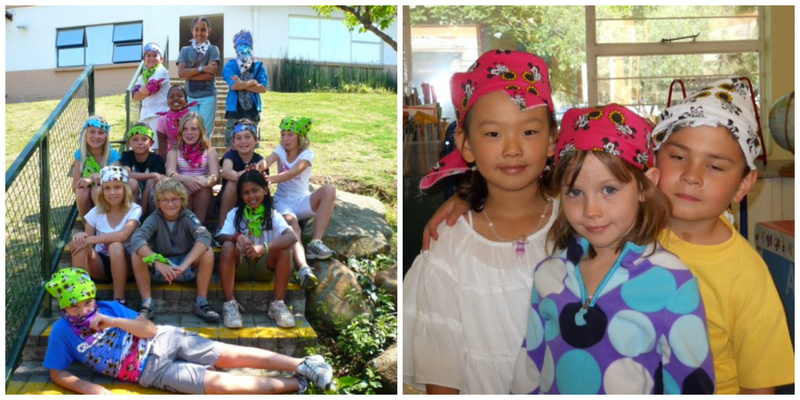 AISJ started supporting the Sunflower Fund in 2010, with just the AISJ JHB elementary school buying Bandanas. Then the middle school StuCo join in, next Pretoria joined. This year is the first year have 4 schools are supporting the Sun Flower Fund by buying Bandanas for R25 and Bracelets for R10. Bandana Day is on the 12th of October and it is a National Day. AISJ's StuCo will be selling Bandanas and bracelets at school. The Sunflower Fund (Friends of the South African Bone Marrow Registry)was formed in 1999 because the South African Bone Marrow Registry (SABMR) is in desperate need of donors from all ethnic groups and mixed ethnic backgrounds. Without financial support, the work of the SABMR would come to a complete halt and bone marrow transplantation would no longer be a treatment option in South Africa. Teboho Trust Team is an organization of spirited AISJ students and teachers that contribute to Teboho Trust in Soweto in many ways, but the students' focus is on teaching literacy and math to students in Soweto on Saturdays. The group of students this year is full of new faces and the entire group is extremely eager to start teaching this year. For the 2015-2016 year, AISJ students will transition from teaching all grade levels to only pre-k through grade four, which enables students to learn in a smaller class size. This will be more beneficial than last year because a lot of the time the classrooms got chaotic and it made it hard to learn and teach. So, Teboho Trust is really excited to try out this new teaching method. Also, the smaller classes offer more of a connection between the student and the teacher, which is vital to the learning process, and it's a major component to what Teboho Trust is all about. The focus of AISJ's teaching at Teboho is literacy and math, and so the team has been learning about techniques that make it easier to teach younger children. Students have been making their lesson plans to make sure to teach with pictures, puzzles, building blocks, and other things that facilitate the learning process and make it more fun. 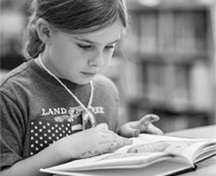 The library this year will see some changes with adding more books to their selection and responding to the community's vision of what they want the library to be. Last year it underwent cleaning, so this year it is going to be all about making sure it is stocked with a variety of books for all the age groups that will use the library. Teboho Trust is looking forward to having more people join the library group because a lot of help will be needed this year. Overall, AISJ students are really excited to make it a great year for Teboho Trust and hope that it is filled with new ideas and great memories. In preparation for the first visit to the Teboho Trust Saturday Academy, and to help the new recruits to know what it really means to be in this service project, the team met on September 5th to discuss how to be an effective teacher. It also gave insight to this semester's goals and what it is like to actually be at the school. The first order of business was to have a mixer, to make sure that we know each other. 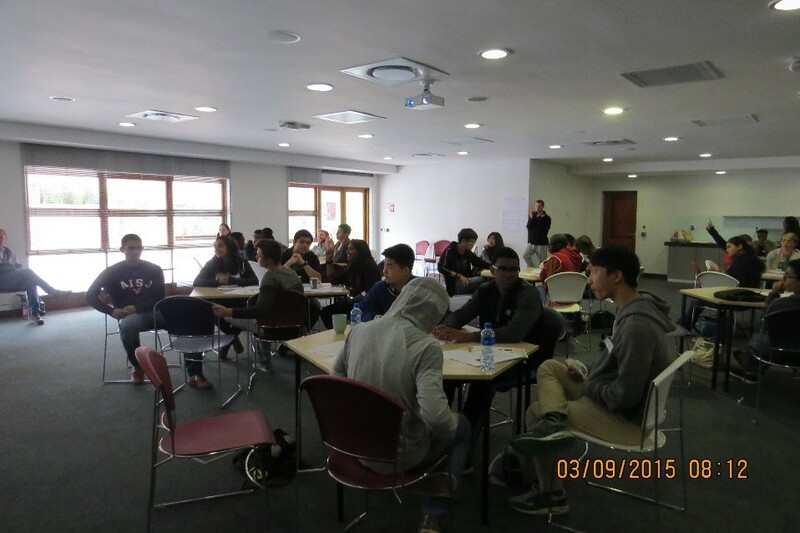 We paired up with three different partners and discussed things relating to service, like why we chose Teboho Trust. This was also a demonstration of a good 'crowd control' tactic used when teaching; younger students cannot stay seated for hours on end, and this is a possible way to start a lesson. This workshop was filled with these kinds of little methods that could be used to control the classroom and make for a successful lesson. I guess this was Mrs. Guedes' way of teaching us subliminally. What is better than teaching without having it felt like a cryptic lesson? Shortly after, we were spoken to by Mrs. Barton about the meaning and benefits of service learning. This helped us to be aware that although service is a requirement, it actually benefits us, as we grow while we reflect on our experiences. We then got to choose which grades and classes we would teach. The grades were from an equivalent of pre-K to 4th grade, with each student having to choose one mathematics and one literacy class to teach. With our teaching assignments decided, we split up into our teaching groups and started to plan the lessons that we would use for the following week's visit. During this time, the room was bustling with ideas of how to properly teach the material, what visual aids to use and how they would keep the class's attention. 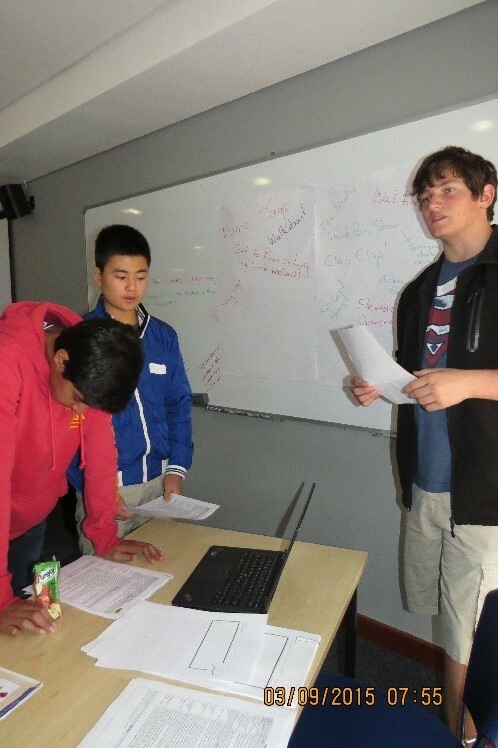 One method that will help with this, which is a new idea for this semester, is that, although 4-6 people will teach in one class, each AISJ student teacher will have a group of around 6 students to teach. This will allow the teachers to be more connected to the students and help the lesson stay on task. Hopefully, smaller groups of students, along with the success of the workshop will make this semester the best semester yet, for both AISJ students and Teboho Trust students. One of the big goals for the team this year is helping the Teboho Trust community plan and run their annual Christmas celebration. As we have in the past, the team will be appealing to the community for donations of new toys, raising funds to fill shoe boxes for the older students and appealing to companies for donations wherever possible. This is definitely an opportunity for the community to pull together and make a difference in the lives of the children. Have any ideas on companies that can help with donations? Willing to donate toothbrushes, soaps, packets of chips, juices? Please contact Tyler Charles on tcharles@aisj-jhb.com or Ms Carla Guedes on cguedes@aisj-jhb.com and let us know how you can help.